Round up a herd of enthusiastic attendees! 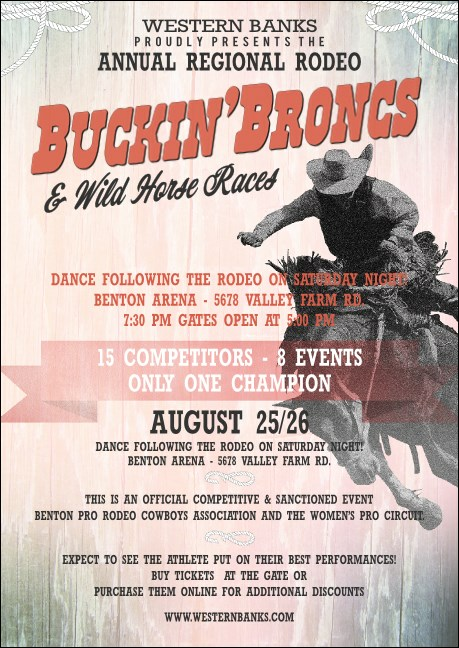 Use the Bucking Bronco Rodeo Postcard Mailer to promote your upcoming rodeo or western-themed event. A cowboy rides an ornery horse behind your event’s particulars, which are laid out in wild-west-inspired typeface. Easy to customize to your needs, it prints in color on quality card stock and is mailed via USPS First-Class Mail to those on your address list. Postcard size is 4.25" x 6"
Attendees will stampede to your celebration when you market it in advance with TicketPrinting.com postcard mailers!